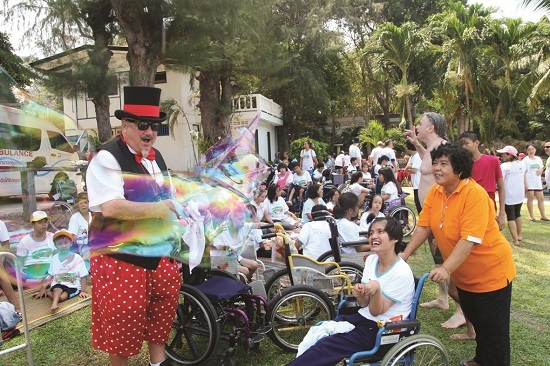 The Rotary Club of Bangkok South treated 270 disabled and underprivileged children from around the capital to a day of joy and happiness by the sea in Pattaya. 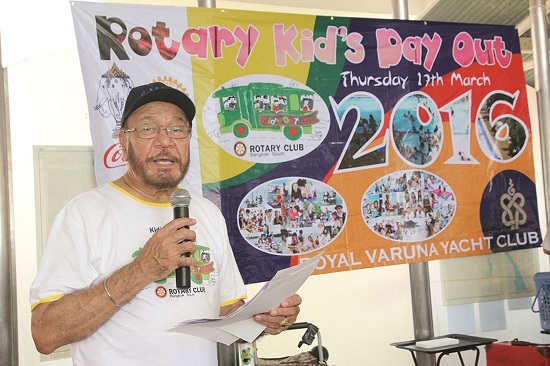 Now in its 18th year, the Kids Day Out program once again had Rotarians working together to create a fun experience for the physically challenged children. 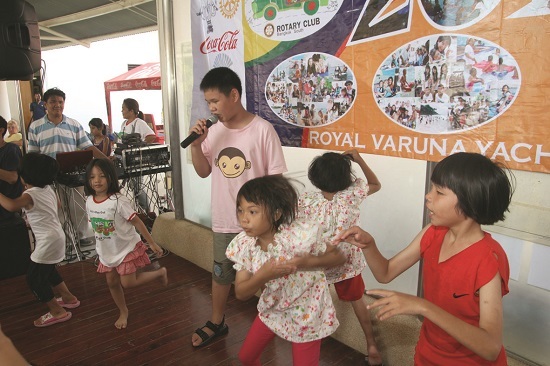 They set off from Bangkok March 17 in 5 buses arriving at the Royal Varuna Yacht Club. 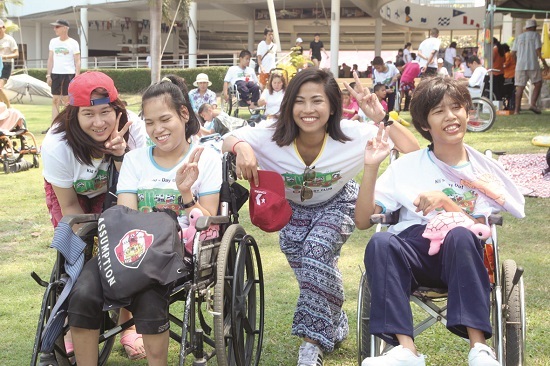 The disabled kids attend Pakkred, Ramintra and Khru Noi schools and were met by members of the Rotary clubs of the Eastern Seaboard and Jomtien-Pattaya while additional volunteers ensured the youths had a safe and memorable day. Shrewsbury International School has been a sponsor for several years and many of their students and teachers also participated, joined by students from Assumption University and members of the Rotaract and Interact clubs. The weather was sunny with a slight breeze coming in from the bay and the children took advantage of it. 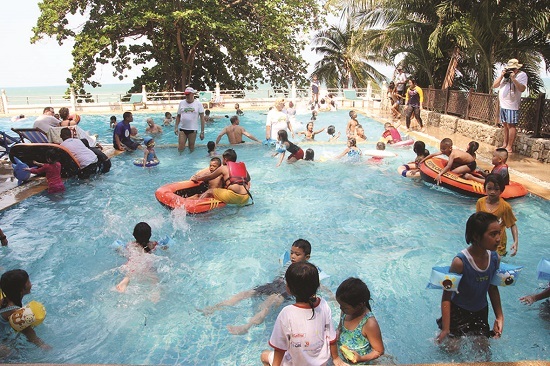 More than 100 Rotarians and volunteers kept a close eye on the children as they frolicked about in the sunshine on the beachfront and in the pool. Those who did not swim played on the grass at the club and for some it was the first time they had ever seen a beach. Back on the terrace, midday was time for an enormous buffet with entertainment of singing, dancing & clapping hands. The lovable Dr. Penguino mingled with the kids and entertained them with his antics and tricks which never ceased to amaze children both young and old. At the end of the day there was a sense of satisfaction and happiness knowing that we had given the children the precious gift of love and happiness. And most especially we gave them the ideas that they can participate in activities that most of us take for granted. As for the love and care givers, we took away the warm feeling of being able to interact and do something positive for these underprivileged children. Narain Suradejvibul, president of the Rotary Club of Bangkok South, thanks all participants for a great day. 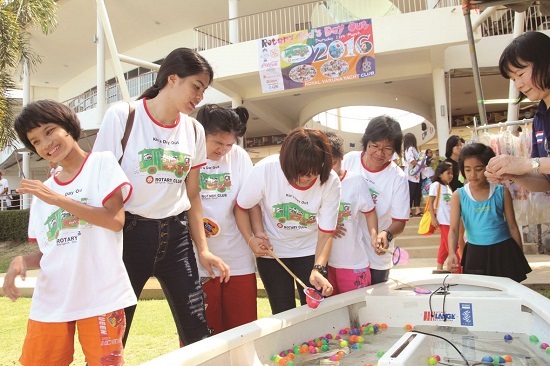 The kids enjoy playing games. Student helpers from Shrewsbury International school help make this a special day out. Time for some singing and dancing. Rotarians and students gather for a group photo at the end of the day. Dr. Penguino once again is the highlight of the event. A bit apprehensive at first, and rightfully so - but soon to enjoy floating in the refreshing water of Pattaya Bay. A volunteer gives ice cream and treats to one young girl. The swimming pool is a most popular place to hang out and enjoy. No inhibitions in these children, total confidence despite their disabilities.